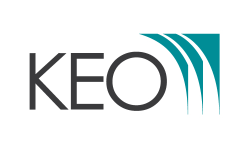 Founded in 1964, KEO delivers world-class professional design and management services. KEO offers award winning architectural design, progressive infrastructure engineering and highly ranked project and construction management known for quality and professionalism. KEO is one of the largest AEP/PMCM firms and have consistently ranked in ENR in the top 200 International Design Firms as well as Top 20 International PM rankings 2004-2011. BD World recently ranked KEO #44 in the Top 100 Architects in the world.